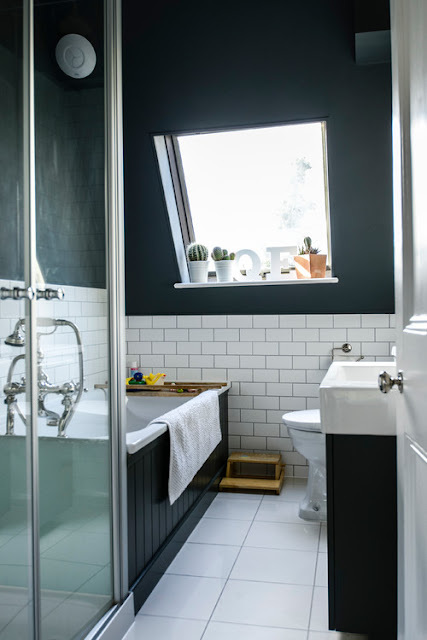 It's no secret I have a love affair with black paint - my front doors are black, I just painted a ceiling black and I pretty much use some kind of black accent in every room in the house. But I've never painted an entire room black. Not because I don't love it but just because I haven't gotten around to it. 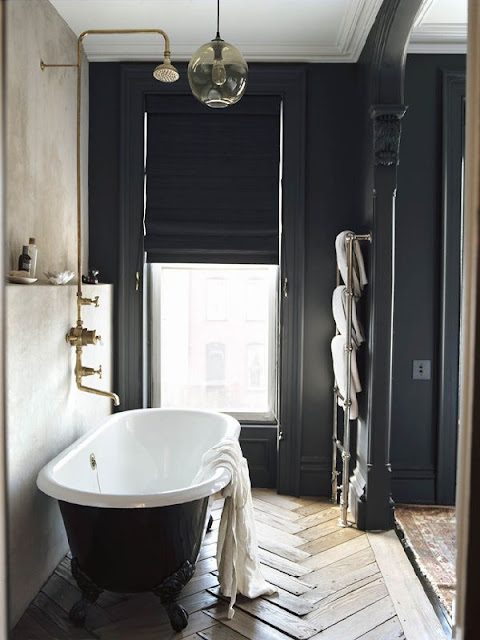 But these amazing black bathrooms prove its time to cross that off my list and go dark in the guest bath. 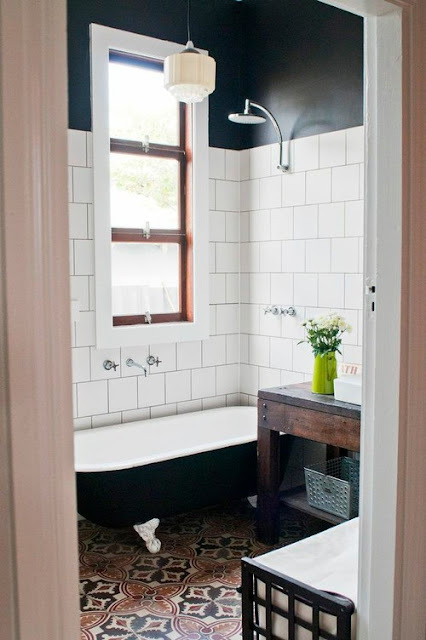 Ok so technically even when I paint my guest bathroom black it won't be an entire room b/c of the tiles but still, I'm doing it. I just need to decide what kind of shelving, lighting and accessories I can add to finish the look. Would love suggestions if you have seen something great in your travels. Now where did I leave my painting shoes? 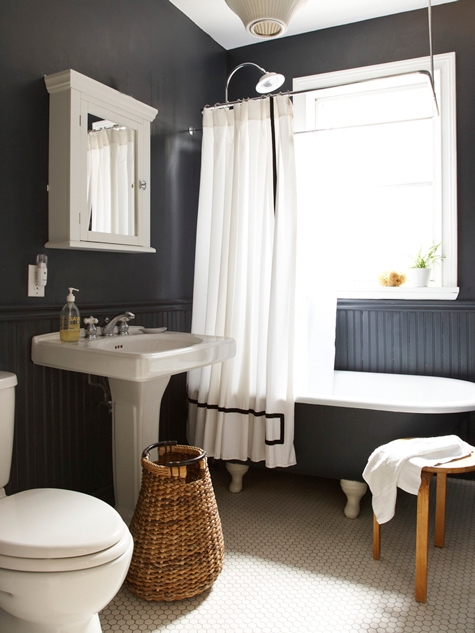 Yep - this is exactly my plan for my half bath. That bottom left image has been inspo for quite some time for me. I tried to go black in my bedroom, but every black I tried still looks slightly navy. *sigh* Ah well, it's still dark and luxurious. Oh I wanted to try this in my bath too. 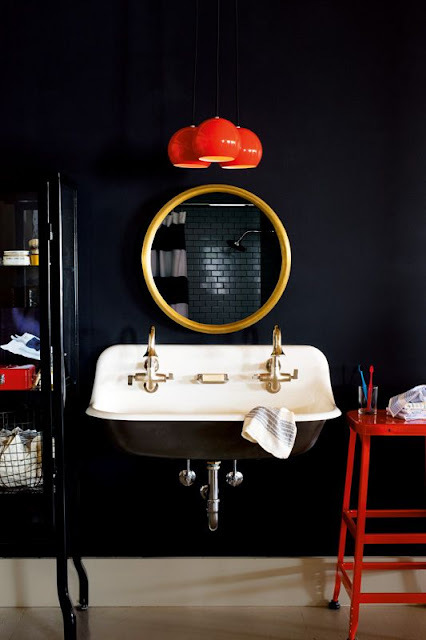 So go for the black bath, girl! That sounds dreamy! Have you posted photos anywhere? 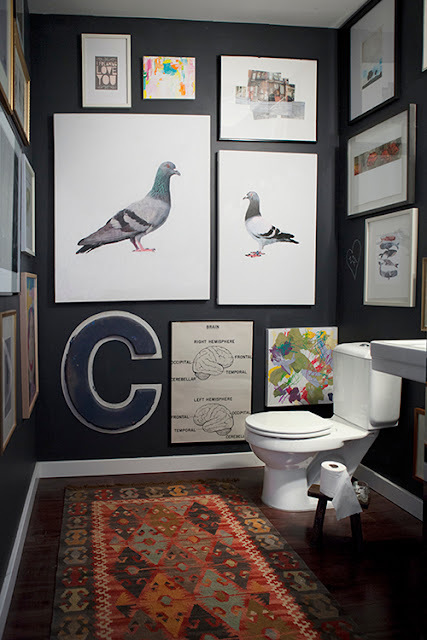 Our powder room in my current house is black. White ceramic floor, white trim, white vanity, white everything else. Even black and white art. I like that I can throw whatever hand towel and soap I want in there and it looks intentional. I painted my kitchen black at my last house and I desperately love it. I'm trying to sell it and the real estate agents keep saying "paint neutral colors". What is MORE neutral than black and white?? Some people just have no imagination but your home looks quite neutral to me. Im sure you'll find someone who will love it. These are so inspiring...especially the one with the pigeons.